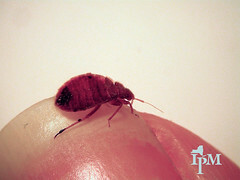 Nassau County’s 1.3 million residents decided to just say no to bed bugs, so their District Attorney’s office spearheaded a bed bug task force in 2009. The results: frequent IPM demos, trainings, on-site inspections, workshops, and annual Bed Bug Summits. When helping residents identify if they have bed bugs or not, I bring my handy diorama of different parts of the life cycle, from eggs to adults…. Comments Off on When helping residents identify if they have bed bugs or not, I bring my handy diorama of different parts of the life cycle, from eggs to adults…. Good night, sleep tight ... Inspection, key to keeping bed bugs in check, is taught here in a workshop for college facilities workers, corrections officers, Cornell Cooperative Extension educators, and pest management professionals.